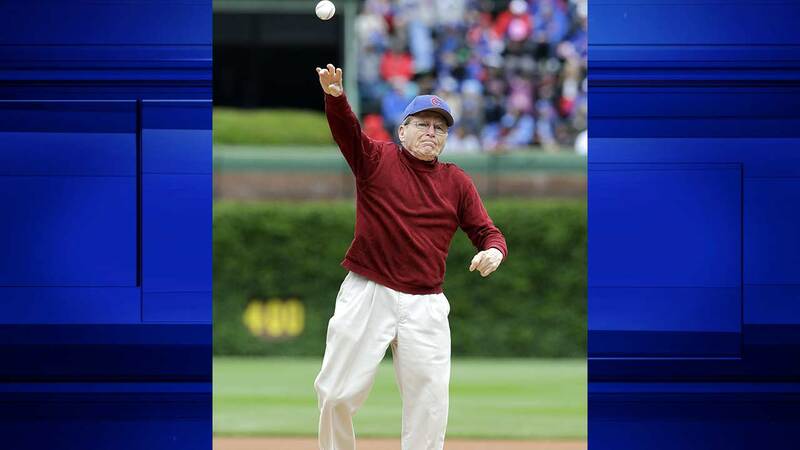 CHICAGO, IL -- More than 70 years after he hoped to make his major league debut, a World War II veteran fulfilled his goal of pitching at Wrigley Field. Tony Gianunzio walked to the mound Sunday and threw out the first ball before the Chicago Cubs hosted the Kansas City Royals. Wearing a Cubs cap, the 92-year-old Gianunzio threw from just in front of the rubber. His pitch reached the plate on a couple of bounces, with Cubs reliever pitcher Justin Grimm serving as his catcher. "It feels just like 1942 when I could do it," Gianunzio said. "I could throw that ball beyond 90 miles an hour and I had a curve like nobody else had one." Gianunzio was a teenage pitching prospect and being looked at by the Cubs when he joined the U.S. Coast Guard. He was a gunner's mate in the service and didn't return to baseball after the war. Gianunzio lives in the vicinity of Kalamazoo, Michigan. He taught English and writing in high school for nearly 40 years before retiring. "My dream really ended with the war, because after the war and late in the war I knew I wanted to get a college education," he said. "I wasn't going into professional baseball - as much as I loved it - because my real love was in teaching," he said. The Cubs were contacted by students from the Compass College of Cinematic Arts in Grand Rapids, Michigan, who are doing a documentary film on Gianunzio. Once the Cubs confirmed the details, they invited him to throw out the first pitch. "I kept my love for baseball, but I hadn't throw a ball, up until two weeks ago, for 45 years," Gianunzio said. "That's a long time. I worked out about 10 times. I would love to come back two months from now. I know I could reach home plate with a decent curveball. I'm not kidding. I'm almost 93, but I feel like I'm 51, 49, right in there," he said. Gianunzio's ceremonial pitch, by the way, was better than the one thrown by actor Joe Mantegna before the game. His toss bounced several times and was way wide of the plate.